Are you ready to build lasting and effective relationships online, expand your digital reach and attract targeted prospects to your business—all via social media? If so, this video training is for you. It’s a fact. You don’t really own your brand anymore, your customers do. 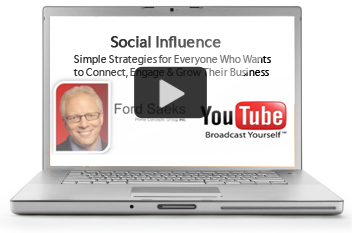 Ford will share strategies on how to navigate, protect, influence and leverage social media relationships. He’ll present strategies on how to leverage your brand, products and services through major social media hot spots, like LinkedIn, YouTube, Twitter, Facebook, and your blog.